Longtime Symphony subscribers Mary and Ron Macnab at their Dartmouth home. 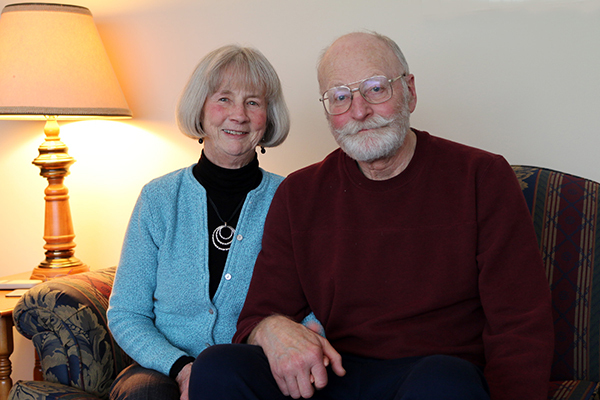 Mary and Ron Macnab have been Symphony subscribers and donors since 1992. With a home base in Dartmouth for close to 50 years, they raised four children and built their careers: Ron was a Marine Geophysicist at the Bedford Institute and Mary worked for the province as an HR consultant. They now enjoy an extremely active retirement pouring their energies into volunteering for a number of charitable organizations. They are world travelers with a love for adventure and a passion for their home province. Music is also a big part of their lives. The Macnabs love to get into their Volkswagen van and explore the back roads. No reservations – just going where the road takes them and never knowing from one day to the next where they’ll end up. The most recent adventure was a nine week trip that took them to all ten provinces in Canada. They have enjoyed plenty of memorable times traveling in Europe as well. One of their favorite trips was celebrating their 70th birthdays by walking 800 km on the Camino de Santiago in Spain. “Travel is wonderful,” says Ron. “It broadens your perspective on so many levels and helps you appreciate the depth of the culture of where you came from. The Macnabs talked about what draws them to the Symphony and why they love it.